Hi everyone. It’s Robert from Sketchy Details back again to announce the next topic for Foreign Chops. Japanese animation, more commonly referred to as anime, has a style all its own in international cinema. Unlike the big studio productions from Hollywood, anime features are targeted at all different ages. Some are designed for very young children while others are only for mature adults. Anime crosses all genres and demographics, so there is something for everyone to enjoy. Here’s a massive guide to get you started. The traditional anime style puts a huge emphasis on emotions and psychology. Facial features are exaggerated and the proportions between character sizes become very fluid to reflect the subtext of the scene. A frightened adult can turn into a small child and an angry child can become a hulking beast. 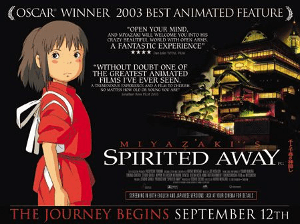 Each website can submit up to 5 posts about Japanese animated films. That’s 5 total per site, not 5 per author per site. They can be new or old reviews, features, or retrospectives so long as they focus on anime films. Send the links to me at robertjgannon@gmail.com by Midnight EST on April 3. Include “Foreign Chops” in the subject line of your e-mail. I will send you a confirmation if I receive your message, so don’t be afraid to message me again if you haven’t heard back from me. I’ll gather up all the submissions and post them on the first Thursday of the month, April 4. The Return of the Chops!